Here are the days that daylight is short and the nighttime is long. Today I spent three hours at the gym (hold on to your hat Rich, I am not finished)… I took an amazing Ashtanga Yoga class with the fabulous Karen Khazzam Dubi and then I relaxed in the Jacuzzi, took a nice hot long shower, went for a steam, grabbed a shake and chatted with a few gym friends. It is rest for the weary. It is hard to believe that just two months ago I finished a Half Ironman. It is also hard to believe that the year is over. The Christmas tree is up, holiday parties are here and little by little reflections of 2013 creep onto the surface of my brain just like every song from the Sound of Music does since the live show last Thursday. It was a year of friends, joyful gatherings, race firsts and incredible triumph for myself and so many I know. The back of my car is beginning to look like a 60’s VW van with random numbers if you didn’t know the secret life of a triathlete and an ultra marathon couple. It was the year we formed the Big Mac Brickers. Early March it was still cold and raw, but we started our official triathlon training as if Union Blvd in West Islip were our road of worship. No stomach flu, cold weather, late Saturday nights were going to interrupt our early Sunday morning dedication to the wind in our face bike ride mecca. We rode “out east” and back, then took the longest transition in history (hence “Big Mac Brickers”.. as if we were taking time to eat a big mac during transition) to go for a run then the break “feast” of bagels, avocado, turkey and Yoohoo. That’s right, the BMB’s know how to party. 90 degree days… no problem, that’s what the pool was for. My friends are my life and there were so many special gatherings and events this year that I will never forget. In early Spring, the gym crew attended a Greek Easter celebration where I am still in utter amazement of all the love and food that was there. There were many races with a metric ton of friend support. Stacey witnessing the zombie walk at Michael’s first 100 mile race. Brian at his 6 hour night time race. Heather, David, Tripp and Janene at the very special Ted Corbitt 24 hour race in Queens. Melissa and Joli coming down to the TOBAY triathlon to see us at the finish line with our medals. Tripp and Janene riding next to me blasting out my favorite music during the Mighty Montauk Half Ironman had me smiling ear to ear and pumped with adrenaline that got me going for the next 6 hours. The pre-race dinner party in Montauk with Rich, Eric, Heather, Christine G, Tommy and Christine that dubbed me the one Gu gal. (The dietitian by trade had to get schooled on nutrition or she would have just died out there). Then the after party with Heather and Donna in Montauk, hitting the bars as I was still in amazement with what my body just accomplished. And of course, my husband at every race no matter what. It was a year I got stronger, wiser and woke up earlier. The six week Spring Equinox Training Camp or ETC starring Dana and Rocky was a world in itself. The 50 + group that met at 5:45am every Monday, Wednesday and Friday became a family. Our blood, sweat and tears on the wood studio floor marked our camaraderie and passion to be better, and more importantly better together. It wasn’t a show to see how many pushups someone can outdo another. There were shouts of support to George and clapping for burpies on the gym floor. Our leaders were great leaders and we continued the unofficial program throughout the summer, fall and winter no matter how cold and dark it was at 5:30am. We even took it outside to the trails and to the road, exploring how running with friends started the day out on the right foot. Difficult times were met face on with a quickly formed running community. 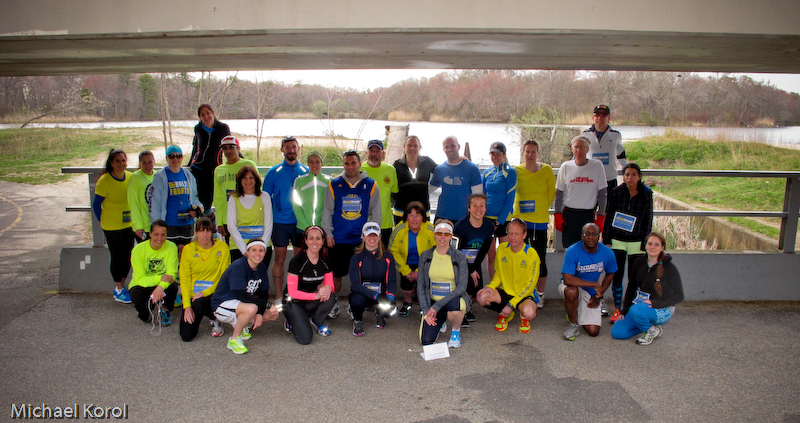 The Boston Marathon tragedy allowed me to meet a great group of runners on Long Island who came out for a tribute run on a cold Monday evening. Many were strangers, some were Boston Marathon runners who just recently came home, but all were there to comfort the community and themselves in what they loved to do, run. It was a beautiful night, and one that tells the story that people rise to the occasion in times of trouble. I am inspired by so many and hope I ooze out the joy and inspiration back out at the world. It deserves it. As I glance up at the shiny star on my tree, I have so much to be happy about and to be proud about. I’d like to think this time of year is to reflect and prepare for what’s ahead. I used to get stressed out thinking there is not enough time to decorate, shop, cook, clean, find holiday attire and celebrate. Now I spend my December Sunday on the couch as the snow falls down and find words to express my gratitude to all those in my life. You are all a part of who I am, because I couldn’t have done it without you. Happy Holidays and Happy New Year.